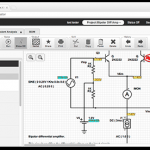 Circuit simulation is a great way to design and debug a circuit without spending all the time to prototype it. One problem in the past was the difficulty in setting up the simulation – picking models, etc. A new simulator called PartSim changes all that. It is online, free, and drop-dead simple to use. It even links to Digikey parts and has some vendor parts available as well. It also has a nice schematic capture and even does diagramming.